"Everybody stop," whispers the wolf man. Foamy-looking mounds of pale-green lichen coat the forest floor. Stands of Scots pine spread an infusion of pencil shavings and mottled light across the scene. Our lupine guide Marcus Eldh lowers himself onto all fours, sniffing at the undergrowth. A primal cunning twitches behind his eyes as he scans the seemingly ordinary brush. Then, leaning back for a Poirot-esque denouement, he fingers his fine facial hair and utters his conclusion: "Recent wolf cubs, several of them. Look how their low bodies flattened the grass. And you smell that?" We hold our breath, completely under his spell. "Wolf piss." 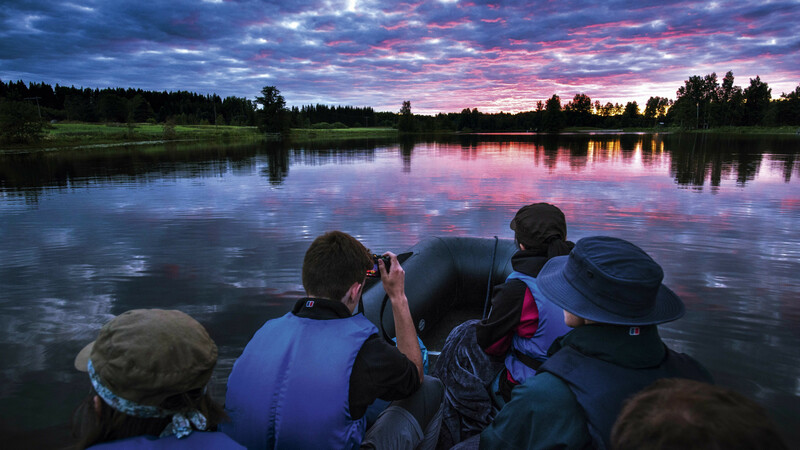 To find out more about trips to Sweden, see Visit Sweden; click here for more information on the Wild Sweden wolf and moose tour. I've come to Sweden for just this kind of no-nonsense wilderness experience. There's been a lot of talk in the UK recently about reintroducing top predators like lynx and wolves back into our midst. But here in the heart of Västmanland – little more than a two-hour flight from Stansted and then a 40-minute drive from Stockholm-Västerås airport – the Swedes put their mammal where their mouth is. So to speak. The whole country, as I'm quickly learning, is bonkers for outdoor action and wildlife. A whopping 70% of the country is covered by forest (the UK is a pitifully denuded 13%), and wolf numbers are in resurgence, with 400 known specimens in central Sweden and around 40 packs. Moose, lynx, brown bear and beaver spill freely through the woods and wetlands. And after Sweden recently welcomed 100,000 Syrians, an initiative popped up to smooth their outdoor cultural integration. Now, in the country's frozen north, there are refugees who are a dab hand at lassoing reindeer. To really understand Sweden, it's clear that you need to be ready for adventure. And that's exactly what we've set out for. Moose are actually so plentiful in this country that on average a driver will crash into half a ton of Swedish meatball every two hours. National car giant Volvo has just started installing 'moose-dar' across its fleet. We spy half a dozen of the magnificent animals. Their surprisingly thin burgundy limbs convey a barrelled upper trunk and just for a moment, as we observe them across the spruce-pine-backdropped prairie, it's like watching a tree uproot itself and start lumbering though the twilight. 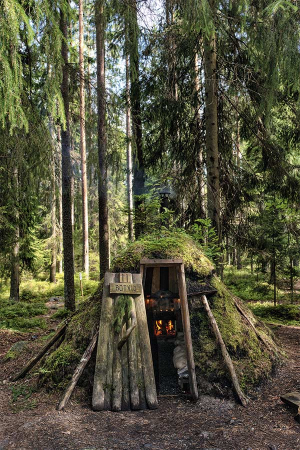 With magic already in the air, we get delivered to our overnight hobbit hole sleeping quarters, deep in the woodland territory of the Billsjön wolf pack. 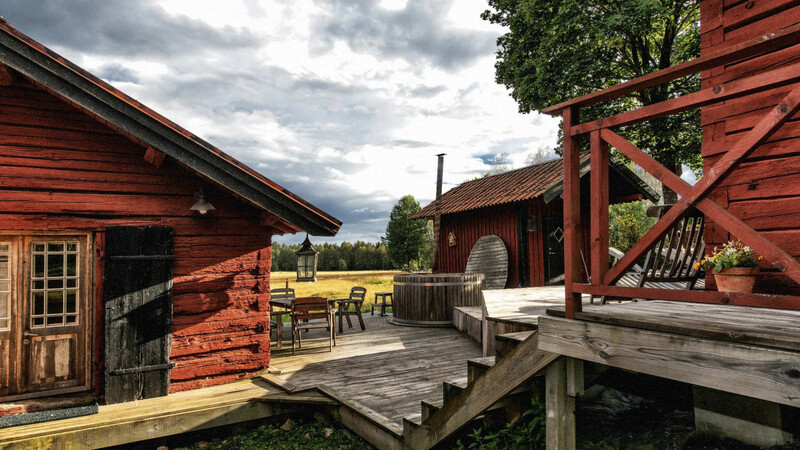 Kolarbyn Ecolodge is the fantastical love child of Scandinavian glamping crossed with Tolkien's Middle Earth. Scattered among the forest are a dozen dens of pitched timber, topped with sprouting grasses and wildflowers. Inside our allocated home we find two raised sleeping births, padded with sheepskin and warmed by an open fire. Next morning we split wood and resurrect our fire, sending the smell of smoke and scrambled eggs across Lake Skärsjön. Down by the lake we discover a floating Swedish sauna. Scantily dressed locals from Stockholm invite us to swim then sweat with them, before sharing in their dubious cultural custom of flogging one another with birch tree branches. "To open the pores," they assure us. Whipped and rested we are ready to hike, setting out like emboldened Bilbo Bagginses to brave two days journeying along the remote Bruksleden Trail. We begin heading east from the town of Skinnskatteberg (even Swedes need a run up to pronounce it), and for the next 24 hours we see no other humans, relishing all the time outdoors, connecting the flashes of bright-orange paint on trees and hiking progressively deeper into the forest. In the deserted Bockhammar hamlet we admire the ancient farmhouses with their manicured rose gardens, neatly kept behind traditional gärdsgård fences of tightly woven spruce. We push on into evening, through tighter trails, flanked by ever-present pine and riddled with roots and endless fungi underfoot. We cross a fetid swamp where golden light streams between shimmering beech leaves, before striking an impromptu camp and boiling river water over a campfire to make coffee. We turn potatoes in the fire while listening for wolves, and then we sleep like the dead. At first light we move on, crossing into the territory of the Färna wolf pack. Chancing your way through the feeding grounds of wolf, lynx and bear has a sort of frontiersman-style romance to it, but also fear. Yet despite popular belief, wolves don't actually prey on humans. Thank Walt Disney's vivid imagination for that. They are certainly aware of us, though. At Ulvsbomuren Wildlife Safari & Lodging that night, we learn that wolves can tell the difference between the first and the last of five human footsteps due to the relative age of the scent, calculating our direction of travel. Chastened about our dull urbanite senses, we set off next morning to the Black River Valley to look and listen more carefully. Here we hope to find beavers. 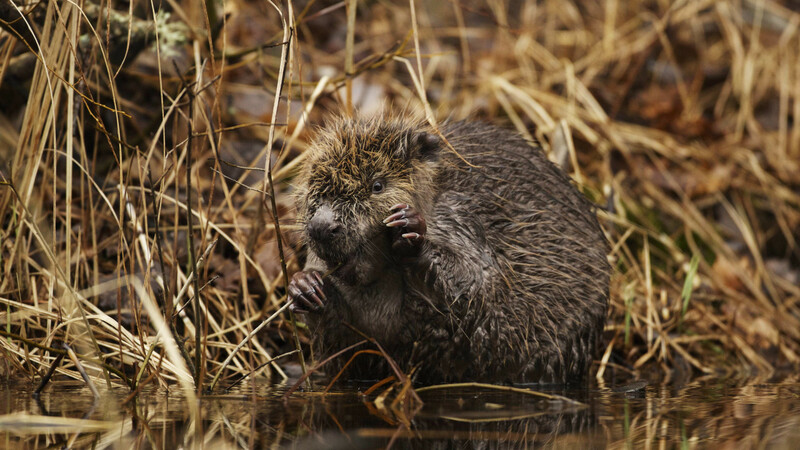 Heralded in Native American legend with the ability to transform into men, the beaver is a creature of beauty and of wonder. John de Jong, our host and guide at Edens Garden bed and breakfast is pretty special too. He greets us next morning in pre-dawn darkness with a gas lamp, a wild grin and the enigmatic words, "ready for the beaver breakfast?" The air is cool as we follow John's prepared trail of gas lamps over a stile, around the dark marshes and down to the Black River and awaiting canoes. Along the way our guide waxes lyrical about the hollow- haired, iron-toothed, monogamous chap we hope to see. We gather John is actually rather fond of the animal. "Beaver then breakfast," whispers my relieved vegetarian sister. We paddle silently through the black water. "If your mind is not quiet," come John's words across the river, "you will not see the beaver slip from the mud bank and into the water." After five days in the Swedish wilds, the background noise of modern life has gone. We still aren't ready for the refinements of wolf urine and whipping. But we don't miss the beaver. With a quiver of reeds he slips downstream, ready to begin his working day.